Stilettos & Grace: Beloved Animal Cookies Saved!!! Hallelujah!!! Glory be. 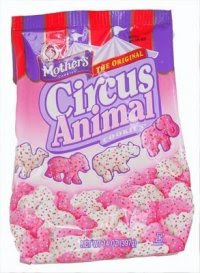 The American Institution known as Mother's Circus Animal Cookies has been saved! (I know there are other kinds, but let's face it, these ARE the most important ones.) Kellogg, we cannot thank you enough. I now feel free to eat without restraint the bags I've been hoarding in my pantry. And, thanks to all those on facebook who joined the group I started: Save Mother's Cookies. Our voices were heard! Okay, so probably no one official ever found the group, much less checked it out. But I'm going to hold to the belief that we made an impact. 286 members and growing... that cannot be ignored. (Well, it SHOULDN'T be ignored.) Way to go! Also, kudos to the Chief Mourner and the Assistant to the Chief Mourner. Our tears were not in vain. Thats so exciting!! By the way, I've decided that you need to work for Glamour...Your fashion do's and don'ts are better than theirs.